It’s 6pm, nothing is planned for dinner and the night is busy. Times like these make it really hard to get a good dinner on the table… a dinner that you can feel good about serving to your family. This is why I always have a jar of the new RAGÚ® Simply Chunky Marinara Pasta Sauce in my pantry. Tonight, with RAGÚ sauce and a few simple ingredients, I was able to whip up a delicious lasagna stove top dish without a lot of time or fuss. 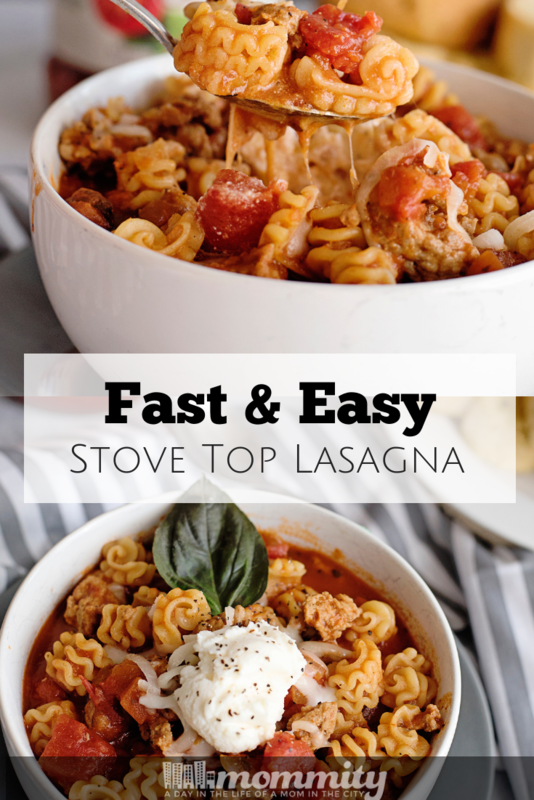 Lasagna is one my family’s favorite dishes, but when you are looking for easy weeknight dinner ideas it’s not one that usually makes the list. I’ve opted for a stove top lasagna dish many times and it has become one of my busy weeknight go-to dinners. 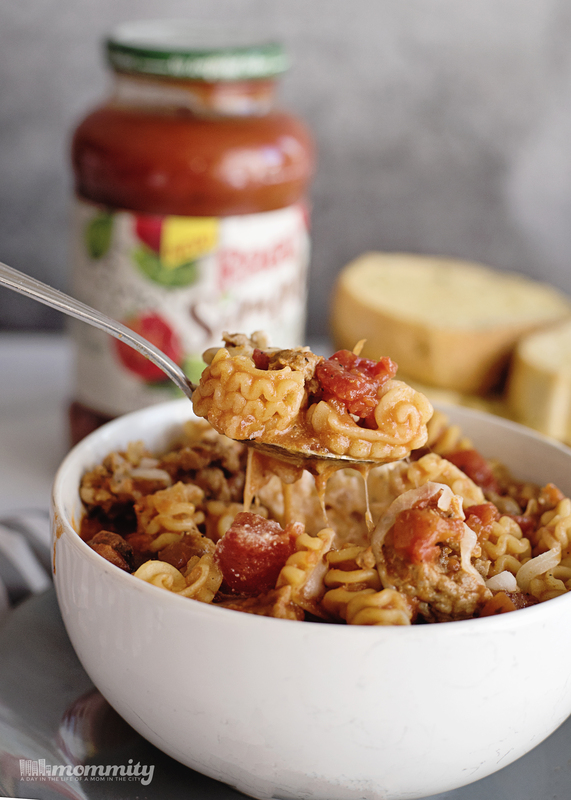 The new RAGÚ® Simply Chunky Marinara Pasta Sauce makes this dish super easy to put together! It’s made with 100% Olive Oil, contains no added sugar and filled with plump tomatoes, onions, garlic and spices. There’s no need for a ton of extras, in this case simple really is better. To start this stove top lasagna, brown the Italian ground turkey and onions in a large skillet. Of course, if you would rather use Italian sausage that would work as well. 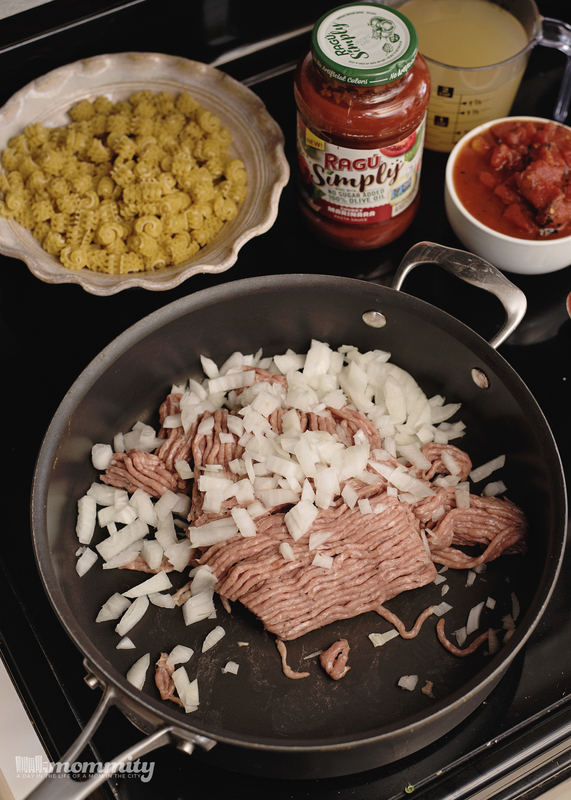 Once the ground Italian turkey is browned, add in the tomato paste and cook for just a minute or two. 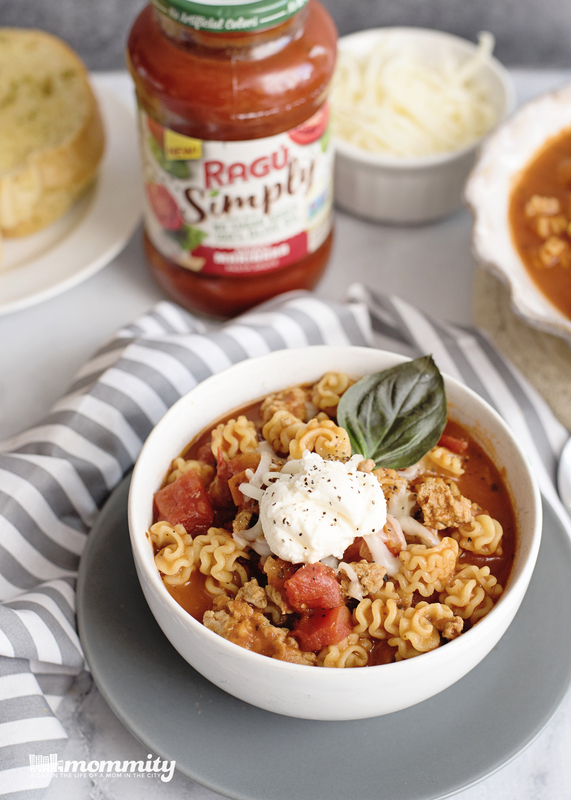 Add in the fire roasted tomatoes, bay leaves, chicken stock and the new RAGÚ® Simply Chunky Marinara Pasta Sauce. Mix until well combined and bring to a simmer for about 20 minutes. After the 20 minutes of simmering, fold in the pasta and cook just until al dente. Note: The longer you cook the pasta, the more liquid it will soak up. If you prefer more of a soupy dish, try cooking the noodles separately and then add to the soup when done. Top with some ricotta cheese, mozzarella cheese and dig in! I love that this version of stove top lasagna is a healthy recipe that can be customized for your liking. Add more cheese! Leave off the cheese! It all works and is simply delicious. 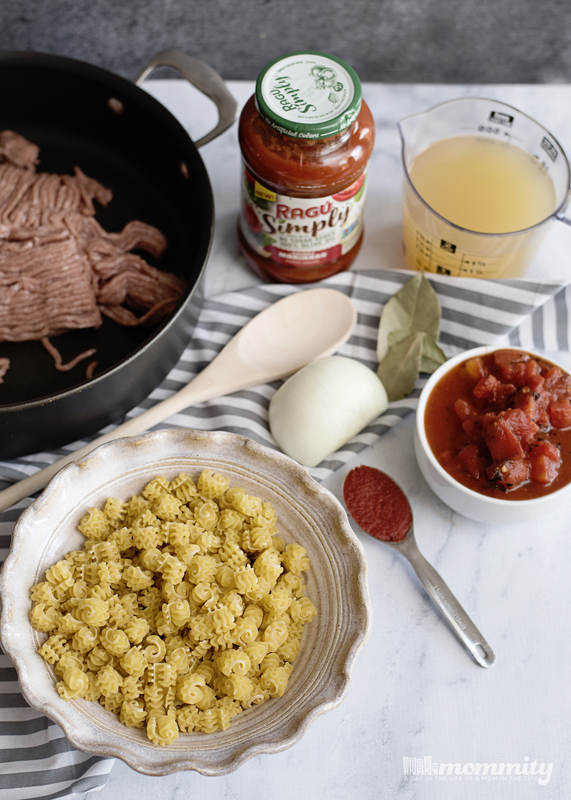 Want a chance to win a RAGÚ® SIMPLY PASTA SAUCE Prize Pack? If you are located in the United States, head on over to the giveaway form. 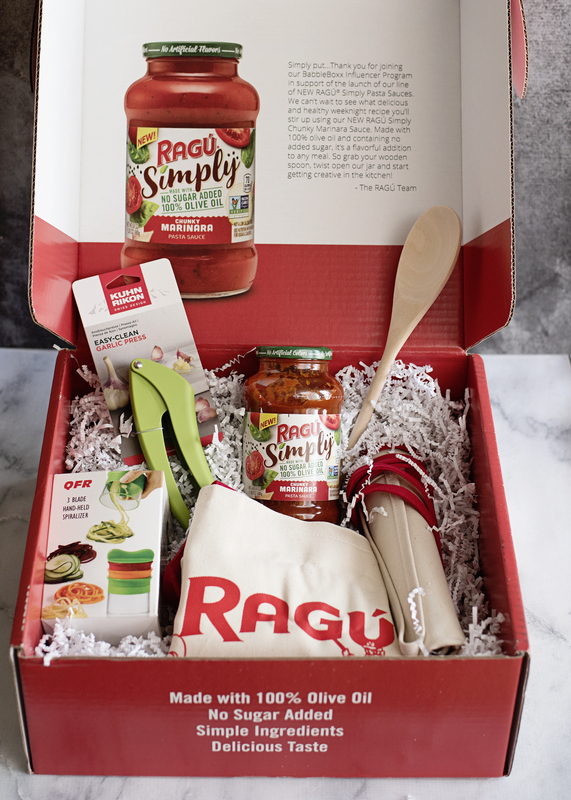 RAGÚ® will be selecting one winner to send one of these boxes to, the same one that I received! Start by browning the Italian ground turkey on the stove, along with the chopped onion. Add in the tomato paste and cook for another 1-2 minutes. 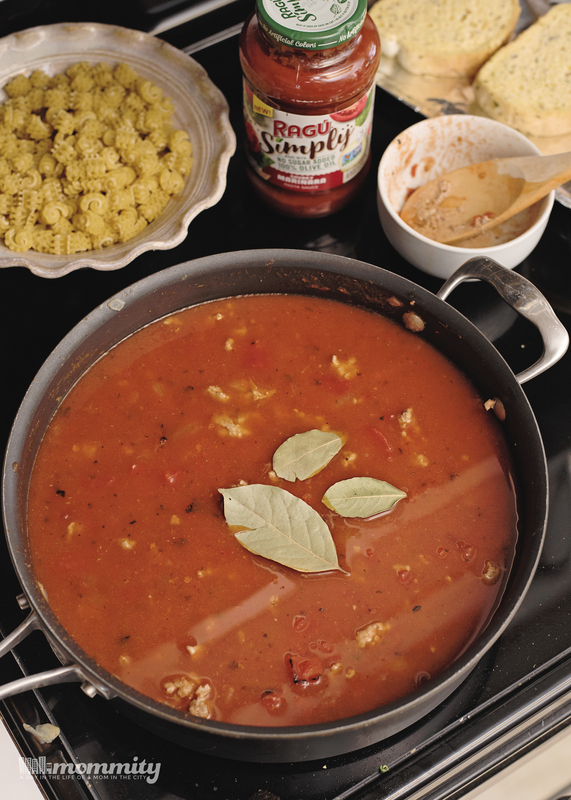 Add in the fire roasted tomatoes, chicken stock, bay leaves and the RAGÚ® Simply Chunky Marinara Pasta Sauce. Simmer for 20 minutes. Add in the pasta and cook until al dente. Serve a bowl, add your toppings and enjoy! Tip : The longer you cook the noodles, the more sauce it will soak up. 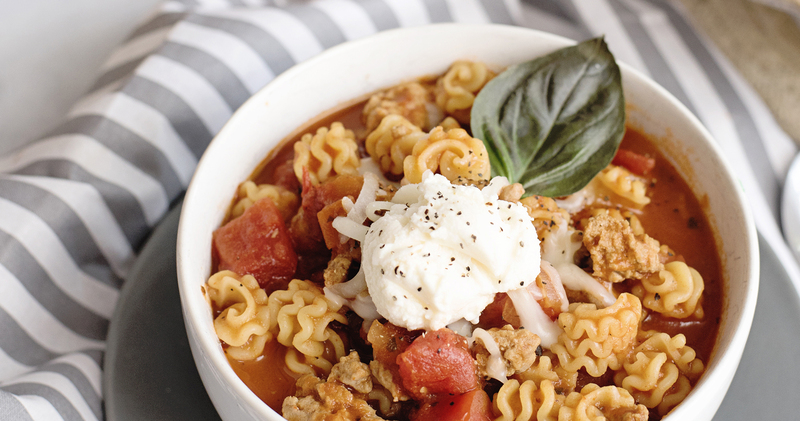 If you prefer a soupy lasagna soup, you might consider cooking the noodles and then adding them at the end. Either way, the taste is delicious! ← Crescent Roll Caramel Pecan Cinnamon Rolls – No Yeast! Crescent Roll Caramel Pecan Cinnamon Rolls – No Yeast!